will allow you to pay without a PayPal account. Introducing Do You Know Who I Am? 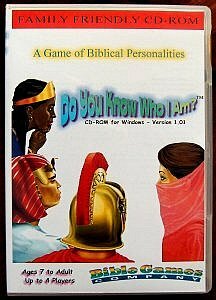 - A Game of Biblical Personalities for Windows. Do You Know Who I Am?™ is a game that tests how much the players really know about various characters in the Bible. The game can be played by up to four human or computer players. The players are presented with clues to the identity of the biblical personality. Players are given the opportunity to guess the name of the described character, and the sooner the player is able to offer the correct name, the more points received. At the end of the game there is even a bonus round for the winning player to test his/her knowledge of the sequence of events in the Bible. Do You Know Who I Am? includes computer players to play against! Try your luck against 1 of the 14 supplied computer players. Try beating "Adam" or "Eve". They shouldn't be too hard to beat since they weren't around when the Bible was written. Or, try beating "Daniel". Be careful, he knows his Old Testament pretty well. Do You Know Who I Am? comes with 225 questions pertaining to biblical characters and 100 bonus round questions! The winner of the game can even print out a certificate to show that they've won! Do You Know Who I Am? is being distributed by Bible Games Company. Available at other online retailers!